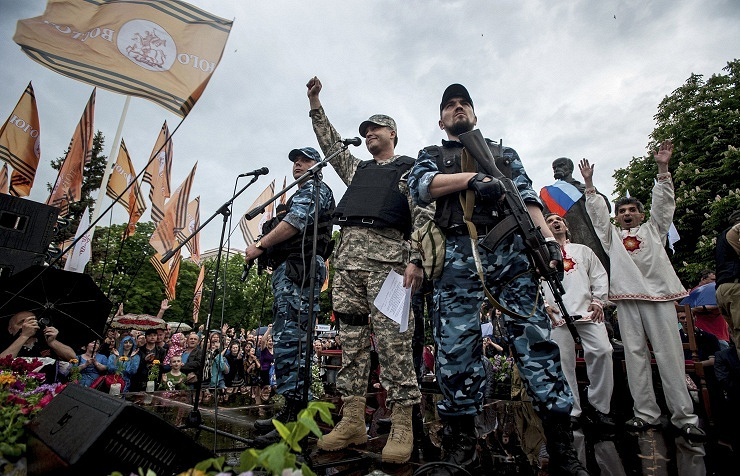 LUGANSK, May 22 /ITAR-TASS/. The government of the self-proclaimed Lugansk People’s Republic (LPR) is ready to sit down to the negotiating table with Kiev if the Ukrainian authorities terminate a punitive operation in Ukraine’s southeast, Valery Bolotov, the people’s governor of the eastern Ukrainian Lugansk Region, said. He called the special operation conducted by Kiev-controlled army units and armed formations in Ukraine's southeast occupation and “terror against the local population”. Earlier Wednesday, Bolotov asked the LPR public to take an active part in forming supreme state power bodies in the republic - the Supreme Council and government, as well as in organizing people’s self-government bodies. Ukraine is in turmoil after a coup occurred in the country in February and new people were brought to power amid riots as President Viktor Yanukovich had to leave Ukraine citing security concerns the same month. Massive protests against the coup-imposed Ukrainian authorities erupted in Ukraine’s Russian-speaking southeastern territories after the secession of the Crimean Peninsula, which declared independence on March 11 and became part of Russia on March 18 following a referendum. Demonstrators in southeastern regions, demanding federalization, seized some government buildings. Kiev has been conducting a punitive operation against pro-federalization activists. The eastern Ukrainian Donetsk and Lugansk regions held referendums on May 11, in which most voters supported independence from Ukraine. After the plebiscite, co-chairman of the self-proclaimed Donetsk People’s Republic Denis Pushilin said the DPR asked Russia to adopt it as a constituent member. Ukrainian parliament-appointed acting president Alexander Turchinov said Wednesday the Kiev authorities are ready for the final stage of their special operation in Ukraine’s east. Turchinov held a meeting with law enforcers in a military camp of the special operation near the city of Slavyansk in the Donetsk Region on Wednesday. The Ukrainian parliament said the key tasks of the final stage were discussed at the meeting. Turchinov said the armed forces are ready to conduct a mopping-up operation in the Donetsk and Lugansk regions and ensure that Ukrainian presidential elections are held there May 25. The people’s authorities of the breakaway regions earlier said Ukrainian presidential elections will not be held on their territories.